I picked Hardnose Mard the Truly Unpleasant as Orc Champion of Slaanesh. Something about his extravagant dress sense just seemed to suggest Slaanesh to me. 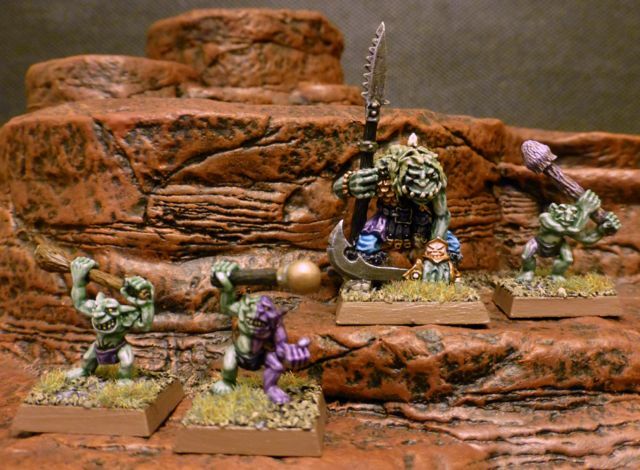 Some nice painting there Subedai.. Any plans for some of the old mutant goblins for this warband? Where is that Orc from I have one myself and noticed the tab is named Mard and not Orc. Thanks. It felt very wrong to get the purple out for painting greenskins. Which made it just right for this side project. I'm not planning on any more greenskins for this entourage at the moment but will rather get painting on some of the Chaos Warriors and Beastmen I have. I didn't know the origins of that Orc either until I came across the Ravening Hordes flyer in the 2nd Edition box, where he's named and described as major hero in Blaccug's Butchers as such: "Mard is Blaccug's second-in-command. Blaccug almost trusts Mard. He is making a mistake. " That Orc champion really is nice! Never seen the sculpt, good find! Thanks, glad you enjoyed the kaleidoscope of unfinished projects that is my blog! Thanks Subedai for the info.. I don't suppose you have a link to the flyer do you? It may clear up a few other mystery orcs i have..
Lovely painting Dubedai, nice to see orcs in somewhat different colour schemes. Mutantdale wrote: .. I don't suppose you have a link to the flyer do you? It may clear up a few other mystery orcs i have.. If memory serves there are only 5 or 6 orcs in the flyer and they are all shown elsewhere. Send me photos and I'll id them for you. Mutantdale wrote: Thanks Subedai for the info.. I don't suppose you have a link to the flyer do you? It may clear up a few other mystery orcs i have. I'll scan it and put it on Scribd, but might be a few days. Just John is right I believe, nothing on there that isn't in the catalogues, but it does have some fun names and background bits.